Paper Things | What is ML Reading? 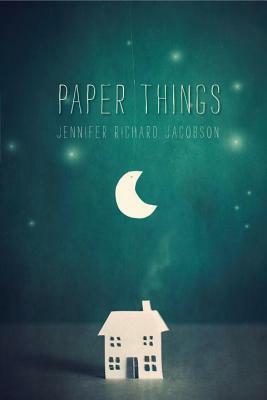 I have not finished Paper Things by Jennifer Richard Jacobson. However, I wanted to put it on people’s radar before the summer rush, especially librarians. I’m providing the publisher’s summary of the book and highlighting a portion of the book, which speaks to me as a library professional. Then, I’m getting back to reading the book! “When Ari’s mother died four years ago, she had two final wishes: that Ari and her older brother, Gage, would stay together always, and that Ari would go to Carter, the middle school for gifted students. So when eigheeen-year-old Gage decided he could no longer live with their bossy guardian, Janna, Ari knew she had to go with him—even though she’d miss baking cookies with Janna and curling up to watch HGTV. What Ari didn’t realize was that Gage didn’t have an apartment yet. And now, two months later, he still doesn’t. He and Ari have been “couch surfing,” staying with Gage’s friend in his tiny apartment, crashing with Gage’s girlfriend and two roommates, and if necessary, sneaking into a juvenile shelter to escape the cold Maine nights. But all of this jumping around makes it hard for Ari to keep up with her schoolwork, never mind her friendships, and getting into Carter starts to seem impossible. Will Ari be forced to break one of her promises to Mama? The paragraph below touched me. It’s a good reminder I don’t know where a person is coming from or the challenges they are facing when I am helping someone at work. “I hope, hope, hope that Mrs. Gretchel is working tonight. She’s the only librarian at the Port City library who’s nice enough to look up your number on the computer if you want to take out books and you don’t have your card. If you lose your card (which I did), you get one free replacement. After that, if you lose your card again (which I did), you have to pay for a replacement. It’s only fifty cents, but I don’t want to ask for it when I know that Gage, who is always worried about money, skips lunch. This entry was posted in Middle Grade Fiction and tagged Jennifer Richard Jacobson, Paper Things by mlreads. Bookmark the permalink. Pingback: Julia’s Review: Paper Things | What is ML Reading?